It seems that however powerful your computer is in terms of hardware, it’s never quite quick enough to do what you want. Whether it’s playing the latest games or video editing/authoring/encoding, most users will want to squeeze every last ounce of performance they can out what they have. Of course you could resort to overclocking, but for for some users that just isn’t an option. If you’re in the middle of something which requires all the resources your computer has got, it’s not ideal if Windows decides to look for updates, run a scheduled task, defrag the hard drive or enable the screensaver, or a background program tries to do something that can interrupt what you’re doing. Many tasks on PC’s these days also require you to close all currently running programs, and many software installers ask you to close all other applications to minimize conflicts and to avoid replacing in-use files. One way to quickly close down unneeded programs and services is to use a tool that can do it automatically for you. Theoretically the less you have running in the background taking up CPU time, memory and using the hard disc, the faster and smoother a game or intensive application will run. Here’s 7 free tools for you to try. AlacrityPC is based on an old boosting tool called FSAutoStart which was made especially to improve Microsoft Flight Simulator performance. It’s now designed to help you get the most out of your computer when running anything resource intensive by shutting down unnecessary services and processes beforehand. 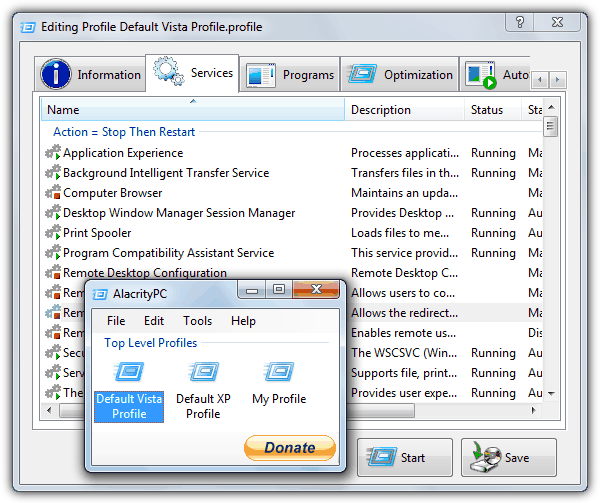 AlacrityPC works with profiles and you can either use one of the defaults or create your own to turn off exactly what processes and services you want. Drag the profile icon to the desktop so you can launch it automatically. There are some additional optimizations, like memory defragment, shut down the desktop shell, removing the wallpaper and shut down/restart the system when an Autostart program closes. Autostart will launch a program after applying the boost, then revert back after the program closes again. AlacrityPC hasn’t been updated since 2008 although it is known to work with Windows 7 and a minor update is on the website but you have to manually copy the files into your Program Files folder. To turn off the update failed message on start, go to Tools -> Options. Requires .NET Framework 2.0 installed in order to run. If you’re looking for a user friendly booster application that doesn’t require much in the way of configuration and you can just click and forget, JetBoost is worth trying. As seen from the screenshot, the interface is clean and simple and for the most basic of usage just click the Boost button. The default boost method isn’t overly aggressive and will simply disable some services, clean the system memory, empty the clipboard, change the power profile to high performance and prevent automatic updates from running. If you want a bit more control by disabling more functions, click the Customize button and you have the option to disable running processes, 3rd party services and the Explorer.exe process. A slightly odd but useful feature is the ability to create a portable version from within the installed application, just click the More icon towards the top right of the window. JetBoost works on Windows 2000 to Windows 8 32-bit and 64-bit. ToolWiz Game Boost is another tool which aims to be easy to use and operate, not confuse you with loads of options that could potentially cause system problems. Like JetBoost, if you want to use the program without configuring anything, just load it up and click on Enter GameBoost Mode and it will start to close and optimize the system components listed. In fact, Game Boost doesn’t have many options to configure, just 2 sections called Boot Option 1 and Boost Option 2. Option 1 has the only default not enabled option which is you can defrag the files and folder the game is in. Defrag the memory and all the Option 2 settings such as disabling scheduled tasks, windows update, printer support, Aero glass, tablet input and network neighborhood etc are all switched on by default. Game Boost exits while the boosting mode is on and you run it again to turn the boost off. Works on Windows XP to Windows 8. 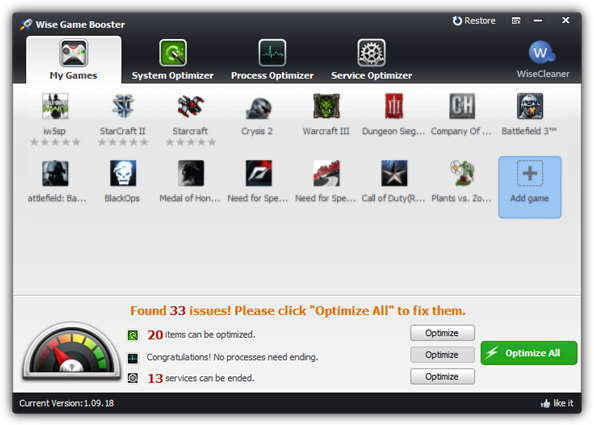 Wise may be better known for their disk/registry cleaning and optimizing tools, but Game Booster is another well put together tool that can help to maximize the amount of system resources available for gaming or intensive applications. To quickly optimize the system, simply click on the Optimize All button in the My Games tab. The My Games tab is a shortcut area where you can place your favorite games that you’ll run while using the program. In addition to a number of system services and any unnecessary processes that get disabled when you optimize the system, there are around 20 system tweaks that can be configured such as running Explorer in a separate process, optimizing 5 network settings and boosting several system response speed options and timeouts. Sadly the program doesn’t have a simple restore button to set everything back to user defaults and you have to set each section back individually. Works on Windows XP and above, a portable version is available. 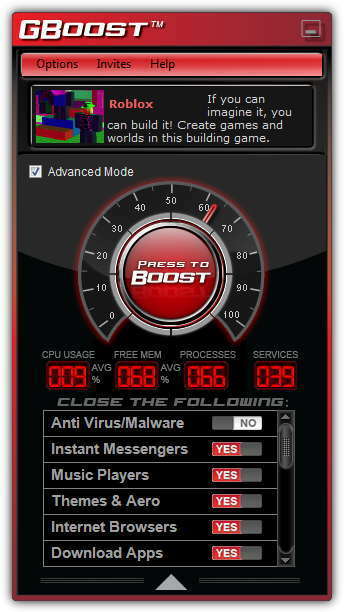 When some users look at the interface of this program it will probably remind them of an overclocking utility, but GBoost aims to be quick and easy at disabling unnecessary services and processes to get the last ounce of performance out of their computer. The “Press To Boost” button will disable the default components and to restore everything back, press the same button again. The dial around the boost button is a simple measure of how optimized GBoost thinks the system is, the closer to 100, the better. Click the down arrow or Advanced Mode box to get a list of everything that can be disabled. Experienced users might not like the generic names for the disable options such as Gamer Utils, Graphic Artist or Music Players etc, because you’re not 100% sure what it’s disabling. It is easier for the more average user to understand though. A couple of small annoyances are the small ad in the top of the window and the words “Processes” and “Services” are the wrong way round in the GUI. 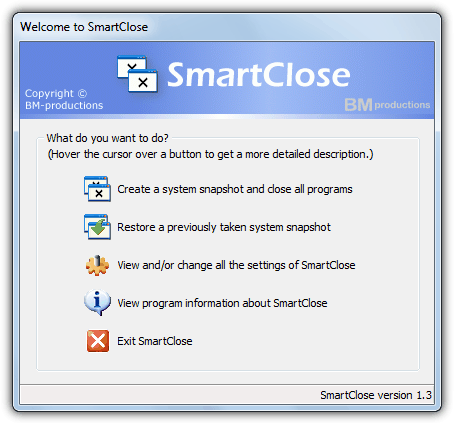 SmartClose is a tool that manages to be easier to use than other tools in some parts, yet more complicated in others. The way the program works sounds more like backup software by using before and after Snapshots to disable the processes and services, and then restore them again. A useful feature is the series of setup wizard windows to guide you through the process of creating the snapshot. During the wizard setup phase you can close all open processes, close (Internet) Explorer windows, disable the screensaver, stop services and whether to create a snapshot file. If you want SmartClose to not kill a certain process, it has to be setup and added as a protected program. The slightly more complicated part is if you want to stop or protect selected services, they have to be configured in the INI text file using Notepad. You can save multiple snapshots for different scenarios and then restore or edit any of them using the wizard. Works on Windows XP, Vista and 7. 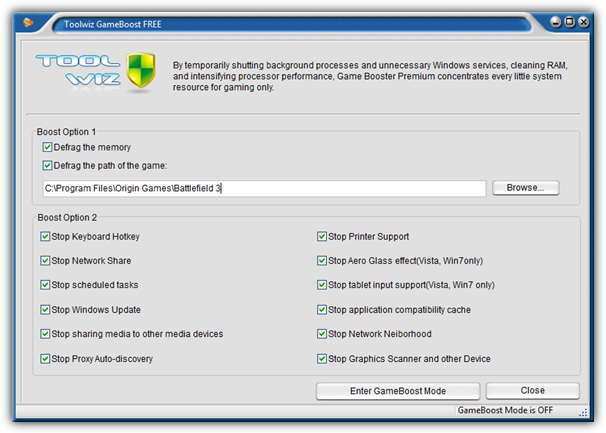 Game Booster from IObit is probably the most thorough and advanced free system boosting tool around if you’re a serious gamer and looking to squeeze every last frame per second out of your system. It works like most other tools by temporarily shutting down background processes, stopping services, cleaning RAM, clearing the clipboard and turning off Windows update. If you want to try and see how it performs without too much configuring, simply click on the big Start Boost button. You can go and customize the process, service and other general settings yourself via the Configure button and add games to the Game Box which is more of a quick launch and boost window. Game Booster goes even further by being able to check for driver updates, defrag the files for each individual game in the Game Box and apply a few general system tweaks, there’s also a temperature monitor at the bottom of the window. Some useful extra gamer tools are the options to save a screenshot or even video of your session, and put an FPS counter onto the game screen. They’re controlled via configurable hotkeys. For the latest version of Game Booster, IObit has partnered with the PC peripheral manufacturer Razer and now you have to create an account at Razer to use the program. 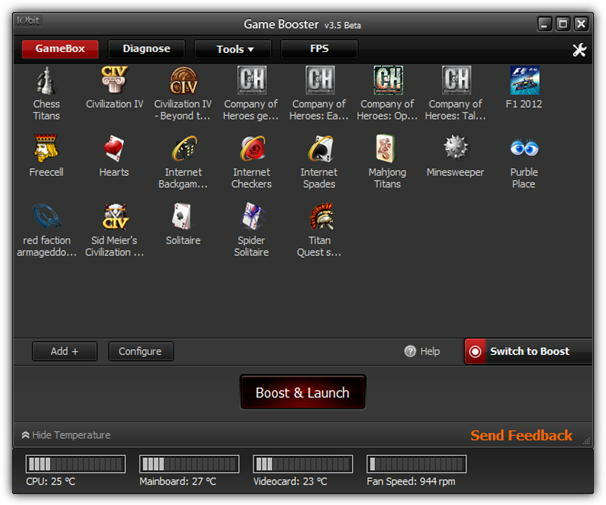 Many long time users of Game Booster recommend the earlier 3.4 or 3.5 beta version as they don’t require registration, are less than half the size but have similar features. If you want, you can download Razer Game Booster and have a look. Note: We did also test another tool called Game Fire. Sadly the program uses the InstallQ setup manager and offered a staggering 7 windows of adware during install. We consider that many unacceptable and can’t recommend Game Fire when all the tools above offer no adware and do a similar or better job. Game Fire also calls itself “Open Source” but you have to buy the pro version to get the source code!! Editor’s Note: The effectiveness of these tools obviously depends on several factors, and mileage will vary from computer to computer. If your system is well maintained and you keep tight control over what services are enabled and which programs run in your tray etc, then the gains will likely be too minimal to notice. However, if you tend to have several tasks running in the background or your system isn’t very powerful, shutting down everything possible could give enough of a boost in performance to make a noticeable difference. I’ve used EndItAll for years and it works great. Its also pretty compact and simple to use with little confusion. See also AlomWare Reset (at alomware.com/reset.htm) which closes all apps and makes your PC feel like it’s been rebooted, without actually doing so. Is there any program that can auto kill a process that is using too much RAM? Like there us a program I’ve been using that for some kind of crash sometimes takes all of my memory, where it usually uses up to 600 mb it ends up using all of it until the PC BSOD. So a program to auto kill a specified program that uses over a specified amount of RAM. GBoost doesn’t seem to be working. It starts up and says it has to connect to it’s servers and then shuts down. Thanks a ton. Bloating windows, unimaginative customer experience and completely woeful design is what marks windows and growing linux popularity, which has very smooth operations.. Microsoft is a lost case if they do not realize to read the hardware specs and configure the QOS accordingly, it needs to get rid of growing updates and automatically close idle services when I configure it for Optimization. It’s been decades but still the same issues, every few months, we need to back up and restore to factory defaults.. absolutely unwanted stuff. Is not easier for Microsoft to buy one of these and integrate with the OS, if their engineers are absolute dull not see these issues .. I may be wrong but this is the issue faced by me for ages.. I have to keep writing batch files to clean my stuff or rely on cccleaner or glary tools all the time. .. but nothing works except periodic factory defaults or restore backup..
Are there any apps that do this for Linux? I’m not against windows but I made the jump to linux after they abandoned xp like a red-headed step-child. P.S. I am not against red-heads either. These programs look questionable to me. How do I know it’s not gonna muck up my computer? Wow, this is a dandy. There are many times where a system completely locks up and you can’t figure out what program is causing it. I suppose that’s where this comes in. This is an insane program. How do you find such amazing apps? THANK YOU! just what i was looking for, you freaking rock mate! Thank you very much ray. This is a very good tool.